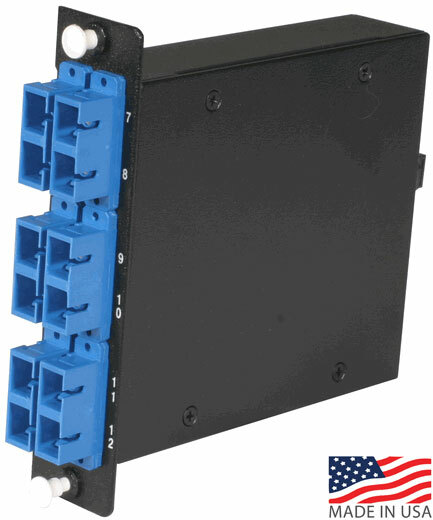 These Singlemode 9/125 micron optical cassettes allows for insertion of one or two 12- or 24-fiber connectors. They couple with a USConec MTP brand connector inside the cassette and fans out using Corning fiber glass in a ribbon configuration to 12 LC connections which then can couple with 12 ST, SC or LC fibers in the front, or 24 quad-LC connectors for the 24-strand model. The cassettes can be snapped into our standard WAC and RAC fiber enclosures.